Al Mesmar and Dr Al Guezer at the signing ceremony. Dubai Investments Park, a wholly-owned subsidiary of Dubai Investments and the region’s unique integrated, commercial, industrial, and residential community, has signed a $86-million contract with ABB Industries to commission a new 132/11kv substation within the development. The 132/11kv substation from Dubai Electricity and Water Authority (Dewa) is the seventh operational substation in total across DIP 1 and 2. Located in the heart of DIP 1, it will be energised this July. 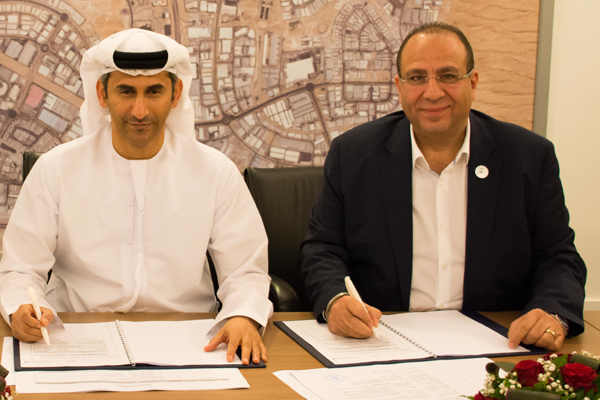 The contract, signed by DIP general manager Omar Al Mesmar and Dr Mostafa Al Guezeri, MD UAE, Gulf and Near East for ABB Industries, covers supply, installation, testing and commissioning of the 132/11kv substation. On the deal, Al Mesmar said: "This new substation will help us meet the demands of the businesses located in Dubai Investments Park. All sectors will be served from this substation and it will ensure the growth of logistics, residential, commercial and industrial sectors within DIP." "The substation shows our commitment to the many businesses in a wide variety of sectors who choose to make Dubai Investments Park their home," he stated. ABB Industries is an approved Dewa contractor and specialist in the field of 132 kv substation projects worldwide. Dubai Investments Park is a unique, self-contained mixed-use industrial, commercial and residential development operated by Dubai Investments Park Development Company. Spread across an area of 2300 hectares, it is a city within a city offering world-class infrastructure and outstanding facilities and services. As a business destination it offers industrial facilities for small, medium, and large-sized enterprises, a wide array of warehousing, a large space for staff accommodation, plus over 20 million sq ft of office space and showrooms, said the statement from the company.